In its article on the subject of “Space Opera,” my beloved Science Fiction Encyclopedia describes the genre thus: “…loosely applicable to any space adventure story, but particularly to those in which the scale of the action is extravagant…” It is as good a working definition as any, but had the authors of this scholarly tome wished to do so, they might just as easily have explained the term by showing pictures of the six book covers of E.E. “Doc” Smith’s famed LENSMAN series. Written over the 16-year period 1934 – 1950, it is the crowning creation of the man who has been called “The Father of Space Opera,” and a series that has been embraced by generations of readers. 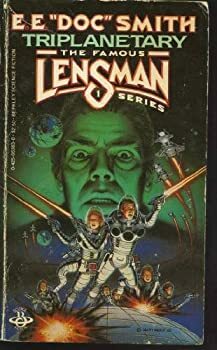 The six books that comprise the LENSMAN series have been sitting unread on my bookshelf for many years now, intimidating me by dint of their supposed epic scope and monumentally detailed story line. But seeing as I have been on something of a sci-fi Golden Age kick as of late, I figured that it was high time to pull up my space boots and plunge manfully into this crown jewel of the era, and you know what? I just loved the series’ opening salvo, Triplanetary, to bits! This first entry of the legendary series has a somewhat complicated publishing history. By the time it first appeared in book form in 1948, Books 3 through 6 of the series had already appeared serially in the pages of John W. Campbell’s Astounding magazine. 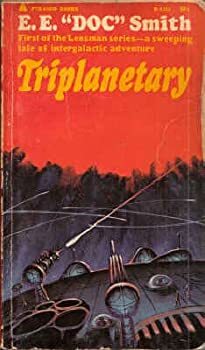 The book’s second section, itself entitled “Triplanetary,” had appeared as early as 1934 in Hugo Gernsback’s Amazing Stories (the first magazine dedicated solely to science fiction), and had nothing to do with the future LENSMAN series whatsoever. 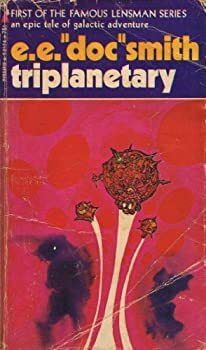 Feeling that his four-part series needed a backstory of sorts, Smith rewrote “Triplanetary” to fit it into the grand scheme, prefacing and expanding it with around 100 pages of even more explanatory material. 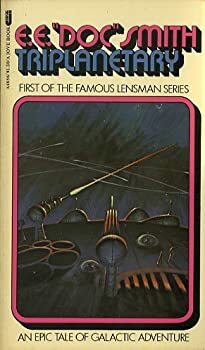 Thus, Triplanetary the novel and its sequel, First Lensman (1950), would eventually comprise what is, in essence, a 500-page backstory transpiring before the main events in Book 3 even begin. And yes, it is a sign of the grandioseness of Smith’s vision that his saga requires so many pages of detailed prequel action before the central story actually commences. And yet, it is a prologue containing so much in the way of story, spectacle, action and adventure that even standing on it own, it would, I feel, be quite a feather in “Doc” Smith’s cap. This series, of course, was not the first far-flung space opera that the Sheboygan-born, one-time food chemist (a specialist in pastry and doughnut mixes!) had delivered to the world — that would be his famed SKYLARK series of 1928 – 1935 — but it is the one that supposedly proved so very mind-blowing to readers back when, each succeeding book (as I’ve heard) expanding the scope of what had preceded it. As I mentioned, the story line here is a bit intimidating, but I will endeavor to synopsize it for you. Two billion years ago, it seems, our galaxy and another had interpenetrated, each one only containing one form of sentient life. From our galaxy had sprung the Arisians, whose Earth-like world gave birth to a people of farseeing intellect and a philanthropic bent. From the other galaxy had sprung the creatures of Eddore, sexless, amoebalike, form-shifting monstrosities of equally great intellect, but “intolerant, domineering, rapacious, insatiable, cold, callous, and brutal.” The Arisians predict that the creatures of Eddore will one day manage to conquer the nascent worlds of both galaxies unless something drastic is done, and so prepare a long-range plan, one requiring many millions of years. Their plan entails subtly steering the histories of several key worlds, while at the same time permitting the Eddorians (who are unaware of the Arisians’ existence) many victories, all in an effort to strengthen Civilization, allow for the formation of a “Galactic Patrol,” and lead to bloodlines that will result in a chosen few who will be able to wield a weapon only referred to here as the Lens. Thus, in the book’s first section, we see how the plan of the nearly immortal Arisians begins to play out, while Gharlane, one of the highest-ranking of the equally long-lived Eddorians, does everything it can to destroy and tear down. We are privy to the fall of Atlantis, a nuclear power that was annihilated by a war secretly provoked by Eddore. We witness a failed gladiator revolt against the Emperor Nero, who, we later learn, was actually Gharlane itself! We then jump to furious action in the fields of WW1, where Captain Ralph Kinnison (a forefather of the Kinnison clan that will figure so largely in all the later books) is sorely injured during a heroic mission. Then, it’s on to WW2, where Ralph encounters major obstacles while working as an inspector in a munitions plant. (Smith himself had run into the same exact difficulties during his own WW2 service.) And finally, it’s on to WW3, in which another Kinnison, Ted, is killed in his fighter rocket while attempting to knock down incoming, transpolar A bombs. It is to be inferred that every setback, in every age, has been the result of the machinations of Eddore, while the omniscient Watchmen of Arisia give up these pawns for the good of the larger game. But it is only in the book’s second, “Triplanetary” section that things really start to take off. “Triplanetary” is somewhat tripartite in nature, offering up three distinct story lines that come together wondrously. In the first, which takes place long after the atomic destruction of WW3, Conway Costigan, an agent of the Triplanetary Patrol, is kidnapped, along with the beautiful, 19-year-old Clio Marsden and Captain Bradley, from their interplanetary space liner, the Hyperion, by a gang of pirates. These pirates are led by a man with the wholly imposing name of, uh, Roger, and brought to the pirates’ lair, an artificial planetoid in deep space. Oh … did I fail to mention that Roger is actually Gharlane itself, still up to its dastardly business, now many thousands of years after Atlantis’ fall? Into his first LENSMAN novel, which again is in essence 250 of 500 pages of prequel backstory, Smith pours enough action and spectacle to fill a half dozen regular sci-fi tales. Highlights include the travails of a male-and-female secret agent team engaging in breakneck danger to avert a nuclear disaster in Atlantis (unsuccessfully, of course); extremely violent WW1 warfare; Costigan & Co.’s escape from Roger’s planetoid and, later, the Nevian home world; and any number of battles, both in outer space and over the skies of Earth and Nevia, employing colossal ships and the technologies of superscience. Thus, a three-way battle between Roger’s planetoid, the Nevians and the Triplanetary forces; a battle between the amphibian Nevians and the deeper-sea fish folk; the battle between the Boise and the Nevians over Pittsburgh; and the final battles royale between the Boise and Roger’s second planetoid and the Boise and the Nevian planet itself, culminating in a destructive climax perhaps partly inspired by the atomic destruction of Hiroshima and Nagasaki a few years earlier. It is all thrilling, awe-inspiring stuff, finely depicted by Smith, who easily engenders that elusive “sense of wonder” so highly prized by pulp readers back when. And the author also peppers his story with any number of pleasing grace notes and imaginative tidbits. I just love when Roger and his pirates touch down on an uncharted planet to effect some repairs, and encounter ravening flora and the bloblike residents of that world. The romance between Costigan and Clio is a touching one, too, their love scenes being written in swooning language to make the ladies sigh; and yet, the author is still capable of delivering a romance line guaranteed to make the reader snicker, such as Costigan’s “If we ever get out of this jam I’m going to kiss you, but this is no time to be taking off your helmet…” Curiously enough, most of the starships depicted in Smith’s story, whether Terran or those built by Gharlane the Eddorian, are globular in shape; apparently, Smith could not conceive of a spacefaring vessel that looks anything like Star Trek’s Enterprise. (The Nevian ships, oddly enough, are fish shaped.) But speaking of Star Trek, Triplanetary also gives us ships that are protected by defensive force shields, and that are capable of holding on to other ships using their “tractor beams.” I’m not sure if these were the first ships in science fiction to be so equipped, but they still predated the Enterprise by many decades. Published in 1934.”Triplanetary” is a science fiction novel and space opera by author E. E. Smith, published in 1948. It consists of two parts. The first explains the series background, which consists of a conflict between the evil Eddorians and the benevolent Arisians. This conflict is carried out throughout the history of an oblivious humankind on Earth. The final part of the book, which was originally published as a magazine story, takes up the tale after civilization has been rebuilt with the covert help of the Arisians; but with everything still at risk… Enjoy the fascinating beginnings of a space opera of the most epic proportions in sci-fi history! Wow, that publication history WAS convoluted! Thanks for providing it. It’s always interesting to see how works come together, since we as readers are usually getting the finished product. I hope that I was able to make it clear enough, though…. Loved these as a young kid. I used to steal them from my dad when he’d lay one down to go do something else, and then refuse to give it back until I finished it. Luckily that didn’t take long and he was pretty accommodating. They’re such fast reads I’m actually thinking about zipping through with you Sandy! That’s funny…I was just thinking that these books are pretty densely written, forcing me to read them fairly slowly. NOT a lot of fluff in them at all. Then again, I am a notoriously slow reader who looks up every word and reference he doesn’t quite get. Bottom line: I have a two-book head start on you, Bill, and you might finish before me, even though the books are most certainly page-turners….